In today’s world, I believe there’s often a strong expectation to push ourselves, work hard, go faster, be better, do more, achieve extra, and overcome any and all challenges by pushing hard and being forceful. I know I’ve felt this pressure – self-imposed or otherwise – to knuckle down and push on, when the inner signals I’m receiving would otherwise encourage me to pause, rest, or slow down. I think it comes from the same origin as the “hustle” mentality. The idea that to get anywhere we’ve gotta work our faces off, bust our guts, and put ourselves through physical or emotional pain and struggle to somehow earn the outcomes we want. It’s as if there’s no other way to enjoy our lives, or reap the fruits of our labours, unless it comes via struggle. It’s almost as though there is a badge of honour for driving ourselves into the ground in the pursuit of our goals. I don’t believe the hustle is the path. I don’t believe working hard is the only way to enjoy a life of abundance and joy. I don’t believe we get the best out of ourselves when we use force. Often, when we use force with ourselves, we ignore the messages our deeper self is sending us. We choose to suppress our true nature, and in so doing, we manifest illness, we procrastinate, we feel miserable. It’s as though we know what’s truly going on, but we’ve got our societal headphones turned up so loud we can’t hear our inner self, our inner wisdom. And I’d been stuck in so much fear about even getting started. I’d been procrastinating. I’d been finding any excuse I could to not write, to not make the time I needed. And, yes, I was beginning to feel miserable, like there was a part of me that was hollow and unfulfilled. On reflection, this has happened to me a few times over the past few years, where I’d been sent strong signals from my inner wisdom to be creative, to write, to express myself and my thoughts. On more than one occasion I’ve broken down in tears talking to Bel about it, crying that I just felt the need to do something creative, for myself, for its own sake. But I let the fear take over again. I knew what I truly needed to do – to write – yet I was so paralysed by the fear of committing to something large (like my unfinished, unpublished book) that I couldn’t start. It gave me anxiety just thinking about committing to something big, so I’ve resisted the call for years now. I finally published the first of my new IQs on Thursday, and to my surprise I was filled with such energy and excitement I was buzzing around the house for hours afterwards. It was like my inner self celebrated with an ecstatic “YES!” and I shot forward into life like an arrow fresh off the bowstring, because I was again aligned with what my inner wisdom was signalling to me. It started with being gentle. I had tried committing to an enormous project as a way of forcing myself to write. I had set – and broken – multiple ridiculous self-imposed deadlines on writing and publishing my book. Using force was clearly not the way, and when I abandoned the project again, it left me feeling broken, and despondent. A few nights ago, before I published that first new IQ, I’d had a great chat with a friend of mine about our respective writing practices, and also spoken with Bel about it. I took the hint that it was time for me to start writing again. But I wasn’t going to dive into an enormous project, nor was I going to force myself to do it. This time around I decided to set a small, easy task of simply writing something, anything, for half an hour each morning. I would rise at 6:30am, no later, and start writing. I’d write for half an hour, before I did anything else. I gave myself permission for the writing to be utter crap; the point was to simply write, and slowly recondition the writing muscle. But most importantly, my intention for myself and my writing was gentle. My experience of my writing over the past few days has been one of joy, and of peace. I’ve discovered that my writing voice has come back far more easily than I would have expected. Getting back into the creative process with the IQ images has felt like getting back on a bike after a few years. The muscles remember how to pedal and steer, and the brain remembers how to balance and coordinate everything. Being gentle with myself, and my expectations, has been the key to creating again. And my experience of it all has been utterly wonderful. I find it easy to carve out the time, gladly sacrificing surfing time or personal time, in order to create. My family have been supportive, and are happy that I’m writing again, because of the joy it is bringing me. This morning I woke much later, as I felt my body needed a longer sleep-in. Now, since waking, I am grateful I listened to what my body needed. I feel I have a gentle yet powerful energy to take into my day, and I’ve had such a wonderful time creating this IQ. It hasn’t felt forced, it hasn’t felt like pressure, and I’ve felt physically relaxed and at ease while I’ve been writing. Too often we ignore what we truly need, because of external pressures, expectations, or ideals. 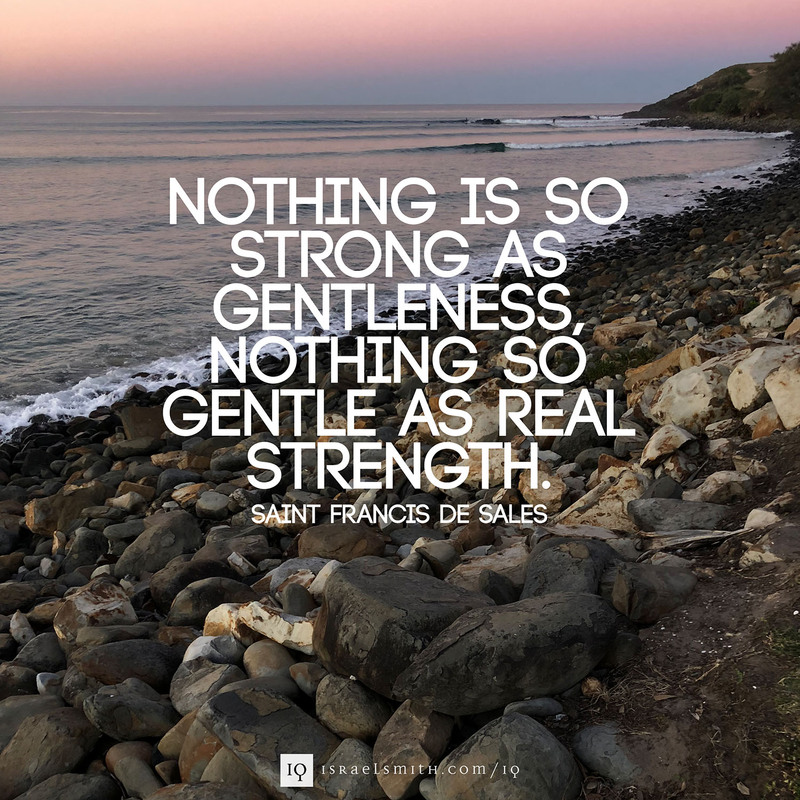 But I agree with Saint Francis de Sales when he speaks that nothing is so strong as gentleness. To me, being gentle to ourselves requires strength: strength to listen, to pause, to step back from the turbulent waters of the river of modern society. To follow our inner wisdom requires strength, but also gentleness, for our inner voice is easily silenced by force, pressure, or mental noise. And the second half of the quote: there is nothing so gentle as real strength. Whenever we encounter someone exuding true strength of character, there is usually a subtlety, a gentleness to their nature. The strength comes from alignment with inner self, clarity of purpose, and determination to hold true to the path even when things are difficult. And it shows up in their demeanour as a calm, gentle person. I’m committed to being as gentle with myself and others as I can, and cultivating real strength in the process. What about you? What resonates with you? Do you practice gentleness with yourself, with others? Let me know.